Even if you can't see them (interestingly, the statistic is about one in twelve people can see subtle energies such as auras and chakras without training), these energy centers are perceived in distinct ways. Let's look at you as an energy being. You know, of course, that your body is composed of cells, which are composed of molecules, which in turn are made up of atoms. You probably even know that atoms are made of protons, electrons, and neutrons. But did you know it doesn't stop there? Physicists report that protons, electrons, and neutrons are themselves composed of even smaller particles. And those particles are composed of still smaller ones…and on down, until we finally have little, quivering, specks of matter. And what are these specks composed of? Why, energy! We've known since Einstein that matter and energy are interchangeable, though it takes a huge amount of energy to create a small bit of matter, and converting a small bit of matter releases a huge amount of energy. Now, we know why: Matter is energy, in a specific form. Therefore, you are energy…pure energy. Left to itself, energy has a tendency to flow, to move, to gather. Energy is never still. Even in its form as matter, those quantum particles are vibrating fiercely. Like a four-year-old child, they just can't sit still. In the Human form (and in analogous ways in the forms of other beings), energy tends to gather in specific ways at twelve spots. These spots are called "centers". They are not chakras—we'll get to chakras in a moment— but they are the points at which chakras form. Because of the way energy tends to gather, the energy at each of these points or centers consists primarily of a certain wavelength. These are not the wavelengths of conventional light, and the energy itself is not light energy; so it can't be photographed with conventional film nor seen with conventional eyes. Nevertheless, these energies have been photographed and recorded with special equipment, and folks who are psychically gifted or trained can often perceive them as if they were visible. In such cases, each energy center usually appears in a characteristic color, as shown in the illustration on the left. 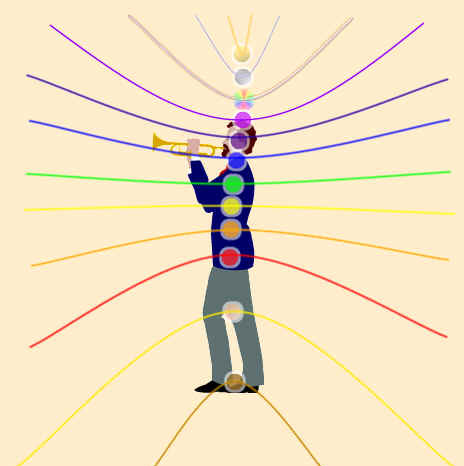 As you can see, three of the energy centers focus above the physical body. Even if you can't see them, these energy centers are perceived in distinct ways. We will describe each in detail in following chapters, but here are a couple of examples: The center located over the heart, when "activated", is perceived as a feeling of intense love. The center located at the throat, when activated, is perceived as having something important to say. .These centers are pinpoints. That is, they are zero-dimensional. They do occupy a specific location in space-time, but, of themselves, they have no length, height or width. You can energize your centers by using the Twelve Centers Breath. This is a simple breathing exercise you can do any time, even while showering or riding the bus! Simply pick a direction, starting from the top working your way down, or from the bottom, working your way up. Each will have its own feel for you, so be sure and try it both ways! If you start from the top, imagine that your breath is flowingin through your twelfth center, about three feet above your head, instead of through your nose. (If you can, you'll want the actual air to come in through your nose, of course. But imagine it's coming through the center. Feed the air down through your eleventh center, then the tenth, and so on, until you "exhale" from the first center, at or below your feet (wherever it feels right to you). Then breathe "in" through your eleventh center, then your tenth, and so on. To start at the bottom, begin your breathing into your first center, exhaling through the twelfth, then inhale from the second, and so on. For an example of this breath used in a meditation, see the Merkaba Meditation. For a variation, cycle all the way through: After inhaling from the twelfth and exhaling from the first, inhale through the eleventh, pass your breath down and then wrap back to the twelfth and exhale there. From each center is emitted a line and a spiral. The line extends, front and back, at a ninety-degree angle (perpendicular) to the line of centers. It is not a straight line, however; it curves through a fifth-dimensional continuum in such a way that it meets itself! If that's hard for you to picture, just think of each line arcing away from the center, as shown in the illustration. This is, remember, a partial view. The lines go on and on. Along each line, energy is gathered, pulled together by the attraction to the line. This energy rotates, forming a spiral around the line, moving in an ever tighter circle as it approaches the center itself. That's why chakra is Sanskrit for "spinning wheel," and why another common word for chakra is vortex. Now, remember, while the lines are infinitely thin, and curved, the lines themselves are merely extensions of the center points. They are, therefore, a one-dimensional extension of the zero-dimensional centers. That's important to keep in mind, because the next step will add yet another dimension. To energize your chakras, try this breathing technique: For each chakra, imagine your inhalation pulling energy from in front and back of you. Imagine that energy spiraling inwards until the fore and rear breaths meet at the center. Allow yourself to feel the tingle and excitement as your center becomes energized. Do this with all twelve chakras. Try it from first to twelfth, and from twelfth to first—the resulting sensations are likely to be different. By adding a second dimension to each chakra/line, the curved lines become curved planes that extend indefinitely outward from the body. These planes are called Systems. They extend the energy of the centers and the chakras to all sides of you. ONA devotes much study to the systems. While it might be possible for a novice to confuse systems with centers or chakras, you can see that the geometry is distinct. Also, the energy of a center changes focus with the number of dimensions being considered; thus, even the perception of a center is not identical with the perception of a system. When we add another dimension to the curved-yet-flat systems, they become extended, flowing at ninety-degree angles from the systems. These are the fields, and they surround the body like eggs nestled each within the other. These fields can be detected by scientific equipment. In fact, the first field is the body itself, and the second is the electro-magnetic field that surrounds each of us!